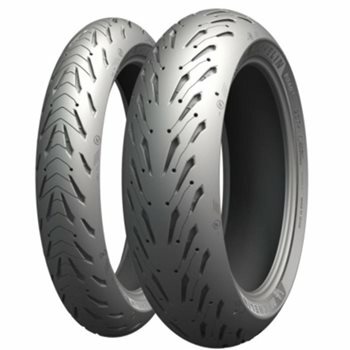 Michelin brings to you their latest & greatest Sport Touring addition, the Michelin Road 5! The Michelin Road 5 combines the latest in tyre technology with the latest generation of compounds and tread pattern design providing the rider with the same wet weather performance and confidence after 3000 as its predecessor the Pilot Road 4 did from new! This performance is the result of Michelin' evolutionary XST Evo sipes. The XST Evo sipes have been designed to increase as the wear increases on the tyre allowing the same amount of water to disperse for a longer period of tyre wear. Mix together this wet weather performance with Michelin' standard high level of dry grip, handling & stability and you will be presented with a tyre that does everything you need it to do...the Michelin Road 5. So the srevice from Visor Shop was seemless and the tyres arrived with the fitter on the Monday having orderd them on the Thursday taking advantage of the free delivery. The fitter had offered to get them for me as he had sourced a pair for a previous customer at a very keen price. When I told him what Visor were offering them at he was astonished, A, because of the price and B, because they had them in stock. The tyres are fitted to a 2012 GS Adv, they replaced some Metzlers. Ive only had chance to ride them a 100 miles or so so really just worn in before i start to push them. So far I cant fault the tyre or Visor. Very Happy, this is what generates customer loyalty.